The first part of the plan is clear: the jails on Rikers Island will be closed. 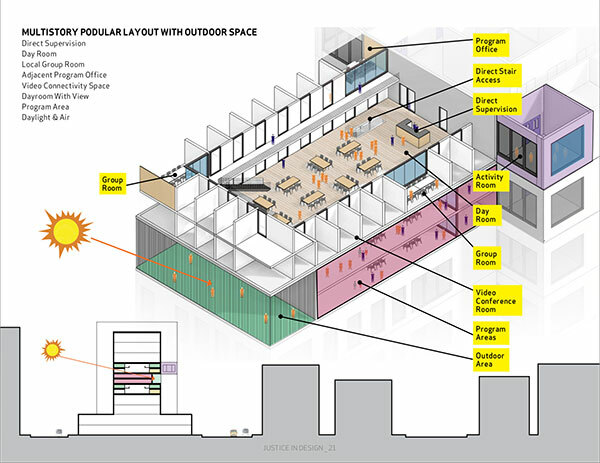 Less clear is the second part: what, exactly, the replacement jails will look like. Both Mayor Bill de Blasio and the Independent Commission on New York City Criminal Justice and Incarceration Reform, empaneled by then-City Council Speaker Melissa Mark-Viverito, came to the same conclusion: Rikers – the isolated island, sandwiched between the Bronx and Queens on the East River, holding 10 of the city’s jails and over 7,000 inmates – must be shut down. In June 2017, de Blasio announced a broad plan to do just that. His controversial proposal calls for continued reduction of the city’s plummeting jail population and the complete closure of all Rikers facilities within a period of 10 years, with remaining Rikers detainees transferred into jails in other parts of the city, using one facility in each borough other than Staten Island. For the plan to close Rikers to work, de Blasio has said, the city must get from the current 8,000-plus inmates across the city to about 5,000, while expanding or opening four facilities. Challenges and questions remain, one of them being that the existing borough jails in Manhattan, Brooklyn, and Queens don’t have the capacity to hold even 5,000 detainees (most of the individuals held in Rikers jails are pre-trial and have not been convicted of a crime, though some are serving relatively short sentences). Shutting down Rikers jails requires the expansion or complete reconstruction of the current facilities, as well as erecting a new one in the Bronx. However, another challenge, which may pose far greater obstacles than merely laying down the bricks of these facilities, is establishing the foundation for a new way of thinking when it comes to designing and building jails. The question of jail design is one of the most important facing the city as it moves toward closing Rikers Island, and aims to utilize the jails themselves as part of the equation in helping people transition after a jail stay of any length and reduce the chances they will ever be back. Among others, one task force convened by the de Blasio administration is working on the issue, while a private architecture firm, Perkins Eastman, has been hired in a $7.5 million contract to take the task force’s input into consideration as it makes design and construction plans. The culmination of the efforts of the task force and of Perkins Eastman will first be manifested into the Capital Scope Development Project Study, set for release by the end of this year, which will gauge the costs of the project as well as assess the capacity of the current borough facilities and explore how these facilities may be expanded or completely reconstructed. For Lippman, the new network of jail facilities that will replace Rikers would imitate a “more normative environment that supports rehabilitation while simultaneously providing the neighborhoods with a couple of amenities,” as indicated in his commission’s study. Crafting such jails would mean to upend the existing conditions on Rikers – a place that Lippman calls an “accelerator of human misery,” with rotting floorboards, sewage backups, impaired heating and cooling systems and incessant violence, according to the commission’s report – and, instead, enhance access to natural light, activity spaces, direct supervision and community involvement. The study also indicated the importance of a facility’s geographic location, since proximity to courthouses can cut travel costs of moving detainees from the jails to courthouses and back, and visitors should have easier access to visit their detained loved ones, which is part of reducing recidivism. Rikers Island is accessible to the outside world by one bridge, and anyone attempting a visit to the island can only go by car (although private parking is limited) and bus -- there is no subway access. In another report produced by the Lippman commission and the Van Alen Institute, providing room for civic services, retail shops or community spaces would be a basic function of a jail facility built with the intent of fully integrating into the community it’s in. Such a building would open up part of the first floor to the needs or desires of the community – say, for an art gallery, or a medical clinic, or a social services agency – while the upper floors would be where the jail operates. 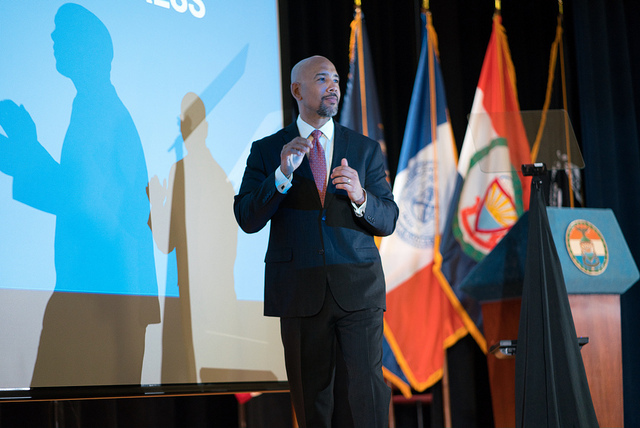 “This is an opportunity for us, not to recreate what we have, but to really begin to think outside the box in terms of what we want,” said Stanley Richards, a member of the independent commission and the executive vice president of The Fortune Society, an organization that provides reentry services for formerly incarcerated people. Richards additionally co-chairs the design committee of the mayor’s task force, where he works on developing design principles that will guide architects and general contractors in the design of the borough facilities. One important question on the table is what will be done with the existing, in-use Brooklyn and Manhattan jails, which are in especially busy areas of the city -- will they be refurbished or torn down and constructed anew, using modern design principles? The recommendations of the commission also provide a basis for what these new facilities have the potential to look like. A network of cells that surround a common living area, for example, can make way for a system of direct supervision, where a correctional officer can oversee more detainees with improved lines of sight. Grouping detainees into housing units based on similar needs or risk-levels also allows officers to apply a more responsive approach when dealing with detainee misconduct, since the traditional approach has been to rely on punitive segregation, or solitary confinement, even for detainees who engage in low-level misconduct. The commission also recommends that inmates have access to a sort of “town center,” or an area that would include a clinic, pharmacy, dining hall, and programming spaces, thus providing detainees more freedom of movement, and they should be furnished in a way that imitates normative settings, with fittings as basic as seated, porcelain toilets and upholstered furniture, all of which contributes to the humanization their detention. 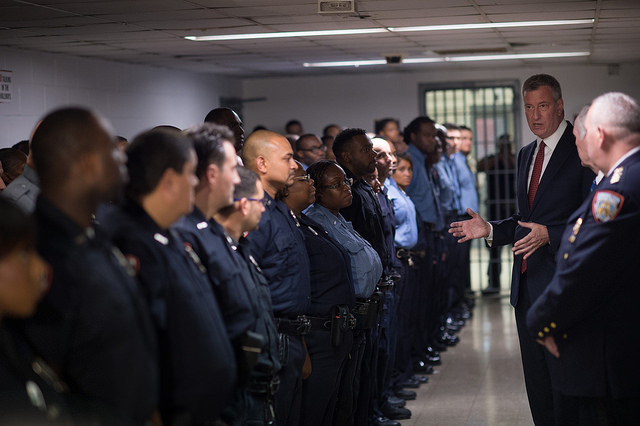 The de Blasio administration has already announced programs to provide more education and job training to inmates, and has launched the “jails to jobs” program to facilitate short-term employment for those finishing a sentence in a city jail. The mayor and the City Council settled on the sites of the Rikers-replacement facilities in an announcement this past February, with the projected borough facilities in Manhattan, Brooklyn, and Queens to be held at the location of the standing detention centers, and the jail in the Bronx being at a city-owned tow pound lot in Mott Haven, though the Bronx site quickly became the subject of controversy and it is still unclear exactly where a Bronx jail will be built. All sites will additionally undergo a single public review process, the Uniform Land Use Review Procedure, set to kick off either by the end of this year or at the start of 2019, involving hearings with the local community boards, borough presidents, City Council members, and the City Planning Commission. One combined ULURP was announced by the mayor and Council Speaker Corey Johnson in order to speed the process, though some have questioned if that will allow enough local input in each affected community. In May, the city’s average daily jail population fell to 8,402 – the lowest number it has reached since 1981. In a follow-up report produced by the Lippman commission, it is projected that the city could close Rikers as soon as 2024 and even have the new facilities constructed before then. Still, while it is one thing to build the new facilities, it is another to maintain them in a way that keeps them from defaulting back to today’s conditions on Rikers Island. Jacobson, who is also a member of the task force’s committee on Culture Change, recalled dealing with staff inefficiency and deteriorating infrastructure during his time as correction commissioner. Jacobson made reference to the jail facilities in downtown Denver and in San Diego, places that emulate the humanizing principles indicated in the commission’s study; they enhance access to communal living spaces, lines of direct supervision and even natural light. From the outside, they hardly look like a jail. Closing Rikers Island jails is the right decision for New York City, but it shouldn’t be at the expense of a thriving community. The Concourse neighborhood in the West Bronx has experienced a renaissance in recent years. Densely packed blocks of tenants and homeowners, public and parochial schools, libraries and mom-and-pop shops surround a glut of municipal uses. Shoehorning a 25-story, 1,500-bed jail into this neighborhood would be a significant and lasting mistake, one that would undermine the progress the West Bronx has made and the progress we hope to achieve through new borough-based jail facilities. A new jail at East 161 Street, behind the Bronx Hall of Justice, would bring additional traffic to an area that already regularly experiences gridlock. There’s practically no parking in the area and it’s not uncommon to find court and police cars parked on sidewalks and in medians. And that’s before factoring in Yankees game-day traffic. Proponents of the 161 Street site argue that by eliminating Department of Correction bus trips, the jail would relieve congestion. It might help, but the traffic generated by correction staff and visitors would increase traffic in the area tenfold. The de Blasio administration admits it has no plans to expand available parking in the area. Unless the City comes up with a real plan to reduce congestion, it’s unfair and unsafe to site a jail in this area. If the 161 Street proposal were to go through, the Bronx’s borough-based jail facility would be less than 50 feet away from one of its highest performing high schools. In addition to the high school, an elementary campus, and a parochial school share the same block. I strongly believe no student should go to school in the shadow of a jail. It would disrupt the learning environment and undermine our efforts to dismantle the school-to-prison pipeline. Simply put, our young people deserve better. Finally, if the administration wants to truly create a more humane jail, I question the rationale behind choosing the site with the smallest square footage. 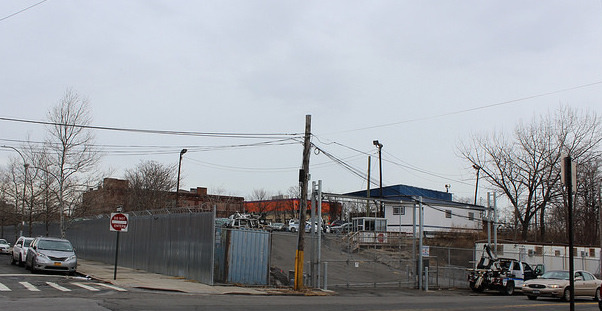 The proposed NYPD tow pound site boasts a lot of 183,000 square feet, in contrast to the 93,000 – 115,000 square feet afforded at the East 161 Street site. Cells, communal spaces, medical facilities, and even correction officers’ quarters will all have to be smaller. Recreation facilities will have to be on the roof, where detainees could potentially see into the apartments of nearby residents. Female prisoners will have to be housed elsewhere, adding even more traffic to the community when they’re bused in for court appearances. The lot size at East 161 Street would require the jail be built at a towering 25 stories, raising concerns about officer response time in the event of an emergency, like a riot or a fire. These are serious concerns and must not be taken lightly. Ultimately, the proposal to site a jail at East 161 Street falls short. Its proximity to the courts may speed up cases and benefit court officers, but the risk to the community, to our children, and to the integrity and intent of borough-based facilities is too great to ignore. The City originally proposed the tow pound site, just two miles away. That site has a larger footprint, allowing for a 10-story facility with ground level recreation, and is several blocks away from the nearest school. I urge the administration to return to its original plan: build a borough jail facility at the tow pound, and allow the Concourse community to keep thriving. City Council Member Vanessa Gibson represents parts of the Bronx. On Twitter @VanessaLGibson. The mayor and speaker made the announcement at a news conference at City Hall, alongside four Council members -- Diana Ayala, Karen Koslowitz, Stephen Levin, and Margaret Chin -- willing to accept the political risk of a new or expanded jail in their districts. The city will launch a unified land use review application for all four jails, the mayor and speaker said, combining the arduous and lengthy multi-stage approval process for siting certain municipal facilities. But the proposal to build the Bronx jail -- the only one of the four that is not either a current or former jail facility -- immediately raised the hackles of elected officials from the borough other than Ayala, a newly elected Council member whose districts spans East Harlem and part of the South Bronx. Top Bronx officials were taken aback that this was the first they were hearing of a new jail intended for their backyard. Any consultations that had happened had excluded Borough President Diaz Jr.; Assemblymember Michael Blake, whose district neighbors the one where the proposed site is located at 320 Concord Avenue, currently an NYPD tow pound; and Assemblymember Marcos Crespo, the Democratic Bronx County party leader whose support helped Johnson win the speakership. “It is simply disrespectful that a decision of this magnitude of proposing to open a new jail in the South Bronx was made behind closed doors, without engaging the broader Bronx community,” said Assemblymember Blake, in a statement released Wednesday night. Crespo, the Democratic Bronx county boss, took to Twitter, calling out the mayor and speaker. “We spent so much time talking the last few months how did this rikers plan in my district never come up?” he wondered. Crespo and the other electeds aren’t opposed to the administration’s goal: building capacity in the boroughs so that Rikers can close. But, he said the Concord Avenue site is not the best option, and the city should explore alternatives. The community and the borough already host their fair share of municipal facilities, Crespo insisted, echoing widespread criticism that the city has long chosen to place seemingly undesirable facilities such as jails, homeless shelters, and waste treatment plants in low-income communities of color. “Make no mistake about it, this borough has been handling an unfair share already for a long time,” he said. “There’s major investments and their success would also be endangered,” he said of the Mott Haven neighborhood, where new development is underway literally across the road from where the jail would be situated. The rapid outpouring of criticism didn’t seem lost on Speaker Johnson, who quickly seemed to equivocate on the Bronx site. “I am committed to facilities in the Bronx, Queens, Brooklyn and Manhattan,” Johnson told NY1. "We are not wedded to an individual location. If there is a better location I am happy to have that conversation." If the Bronx elected officials were stunned by the announcement, it’s little wonder that those who live in the neighborhood around the proposed site were likewise surprised and offended to learn of the plan. The site is located in the Mott Haven neighborhood of the Bronx, north of the Harlem River, with large industrial and manufacturing spaces running between the waterfront and the Major Deegan Expressway. Residents and others expressed a mix of astonishment, resignation, anger, and resentment as Gotham Gazette told them on Friday that the city intended to build a jail within blocks of their homes and places of work. “I thought they were gonna do a mall,” said Jesus Ortiz, 50, who runs an auto-repair shop across the street from the NYPD tow pound that occupies the block. The site is sandwiched between East 141st and 142nd Streets, next to Bruckner Boulevard, in a neighborhood with a mix of housing and commercial properties. 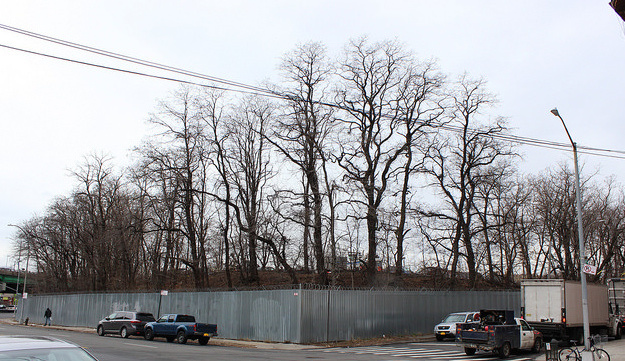 Enclosed by metal sheet walls, the tow pound is almost a hill overlooking its neighbors, with impounded cars visible from the street through a peripheral treeline that is leafless in February. “They’re trying to rebuild the South Bronx to make it nice,” said Ortiz, “That’s not the way to rebuild, by putting a jail here.” Having worked there 15 years, Ortiz said he’s seen rapid development in recent times. Even the building that houses his auto shop was recently bought out, he said, and the landlords gave him a one-year lease till 2019. He’ll soon be gone from the neighborhood too. “They’re buying all around,” he said. Adam Bele, 40, loads containers at the lumber supply warehouse that sits behind 320 Concord. “Nobody wants to be near a jail,” he said. His biggest concern, one that others shared as well, is for the children that attend the several schools in the neighborhood. “You don’t want children hanging around a jail,” said the father of two infants who will likely attend one of those schools, he said. But Bele empathizes with the city’s rationale that detainees deserve to be housed closer to their families in humane and modern facilities, and that Rikers needs to close. “You don’t want them treated like animals, they’re human like us,” he said. The mayor and speaker have promised to seek community feedback on the proposed site and, as required by the city’s land use review process, community boards will get an opportunity to hold votes, albeit nonbinding, to approve or reject the proposal. Borough presidents also get to weigh in with advisory opinions. Along Concord Avenue, in what could eventually be the shadow of a new jail, sit rowhouses, a few of them old and abandoned and showing signs of disrepair. “For Sale” signs hung in a few windows. In one of those houses lives Nereida Chavez, 38, a stay-at-home mom with four kids. “Oh my god!” she exclaimed on hearing that her biggest neighbor could one day be a jail. She worried that a jail could mean more traffic along a little-traversed street. “We have our kids and they love to play out here with their bikes,” she said. And, it might also mean that parking, which has become an issue already owing to the large lumber and oil and gas companies around them, might worsen. “We hardly have any parking here. It’ll be even more complicated if they put a jail here,” she said. At a bodega on East 141st Street, Mel McKenzie, 33, was buying milk. Gotham Gazette asked if the homemaker knew about the city’s plan to build a jail, three blocks from her home. The city’s plan to close Rikers and replace some of its capacity in borough facilities near courthouses entails building for about 6,000 inmates, with the goal of getting the jail population down to about 5,000, according to the mayor. Both women had one shared concern, however, that neither of them had received an opportunity to weigh in. “They should notify the public,” McKenzie said. “As it’s happening, not when it’s already decided,” added Lopez. The city will present plans to the public, particularly through the community board, when the site is set for its place in the land use review process. It may be up to local residents to seek out opportunities to hear more and provide their feedback. Note - This article has been corrected to note that Assembly Member Michael Blake does not represent the district where the proposed jail site at 320 Concord Avenue is located. He represents a neighboring district. Quantifying these incidents for the first time, a new study finds that the rate of traumatic brain injuries (TBIs) sustained by inmates in New York City jails is more than 60 times higher than in surrounding communities. A head injury is considered a TBI if it causes the person to lose consciousness or to become confused and dazed. Published in the August issue of the Journal of Health Care for the Poor and Underserved, the study also provides estimates for the 5,000-plus jails and prisons across the country; the five-person research team concluded that there are some 600,000 incidents of head trauma annually, close to 90,000 of which are TBIs. The new findings could help researchers better understand recidivism and the long-term mental health issues facing many individuals who are spending or have spent time in jail, since these injuries can lead to degenerative brain diseases. They also raise questions about the societal costs of injuries incurred in jails, about officer training, and about the need for better injury and health recording systems in jails, which aren’t required to maintain such data. During a traumatic brain injury, the brain—which has a consistency similar to gelatin or firm tofu—shakes and jiggles within the skull. No matter where the head is hit during a severe injury, the gelatinous brain collides with and scratches against the front part of the skull that has bony ridges, damaging tissue. If there’s enough movement, tissues connecting the mid-brain and frontal lobe move at different speeds, harming connections from one area to the other. This area primarily regulates impulse control, delayed gratification, and the ability to understand abstract and nuanced concepts. Following a TBI, people commonly report an inability to concentrate and high levels of fatigue, among a host of other symptoms that have implications for recidivism rates and employment. Repeated brain trauma can deteriorate brain tissue to the point where it loses some function—a condition called chronic traumatic encephalopathy, or CTE. Symptoms of the disease, which has drawn public attention because of its impact on players in the National Football League, include aggression, depression, confusion, suicidal tendencies, and progressive dementia. The National Institutes of Health has taken the lead on conducting CTE research, but has mainly studied the disease in football players and boxers. Prisoners have not been studied and one of the main reasons, Corrigan said, is a lack of data. Jail and prison facilities across the country aren’t required to keep standardized injury logs, and many facilities haven’t implemented electronic medical records. New York City was among the first to do so, and is one of a handful nationwide that uses records as a surveillance tool to monitor head injuries. The research team behind the new study jumped on the opportunity in 2012 when the city announced it would use electronic health records to monitor medical care in its jails. They tweaked the recording system so physicians working with inmates would be prompted to ask more specific questions if their patient had a head injury—including detailed descriptions of the immediate effects, and how the injury happened. The researchers looked at 42 months of records of nearly 275,000 New York City inmates, and observed that, over this period of time, nearly 14 percent of inmates suffered a traumatic brain injury. After examining emergency room and clinical records across New York City, the researchers calculated that the rate of TBI sustained in jails over the three-and-a-half-year study period was about 63 times greater than in community settings. Experts said there’s no reason to believe much has changed since the study period ended. A possible limitation of the study, said lead author and physician Anne Siegler, is that someone who experienced two traumatic brain injuries could have been counted as two individuals. The researchers were unable to identify unique incidents in the emergency room data due to privacy reasons, and therefore chose to tally each head injury as one. The study was able to identify causes. The team found that inmate-on-inmate fighting and the use of force by an occupational officer were the greatest sources of head injuries: 42 percent (5,966) and 23 percent (1,776), respectively. Other causes included self-injury, slipping and falling, and attacks. As they began to collect data, the researchers noticed how frequent head injuries were, which echoed their anecdotal experience. Homer Venters, an author of the study and former chief medical officer of the New York City Health and Hospitals Corporation, described hundreds of visits he had made to city jails during his two-year tenure that involved treating patients who had suffered head injuries. Often, Venters recalled, a light would go on for an inmate he was treating when he began reciting the cognitive issues associated with TBI. “It runs counter to the narrative they get everywhere else, which is that they’re lazy, they’re dumb, or there’s a problem in their will or moral character,” said Venters, who is now the director of programs at Physicians for Human Rights. One patient Venters worked with said he used to read hundreds of pages a day before a correctional officer injured him; afterward, he had trouble reading more than a page or two in one sitting. He told Venters he felt tired and unable to follow the text. Experts in the field say the new findings are alarming, particularly when extrapolated to the national level. The 600,000 or so head injuries that the researchers estimate occur in jails nationwide would amount to an additional 40 percent of head injuries if included in data collected by U.S. public health systems, said Venters. The Centers for Disease Control and Prevention estimates that 2.1 million individuals suffer TBIs annually. Experts say that the new findings suggest that only better record keeping will make fully clear the extent of the injuries on a national scale, and that training programs for re-entry should include discussions of TBI and its implications. Another study published in February 2017 found that former inmates in Indiana with TBI were more likely to return to jail than former prisoners without TBI. Corrigan described the importance of arming re-entry workers with strategies to effectively communicate and create treatment plans with this subset of the formerly incarcerated population. If someone is displaying a short attention span and has a history of TBIs, slowing down when explaining something, recapping points and asking them to summarize major points can help them process information.